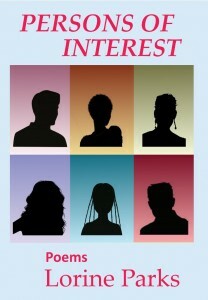 “There is a new book of poetry and prose on the horizon of the Inland Empire, a book establishing its place in the literature and lore of our tantalizing region and carving out its own storied spaces here in the voice of San Bernardino Valley native liz gonzález,” says Ruth Nolan, Contributing Columnist to the Inland Empire’s Press-Enterprise newspaper. 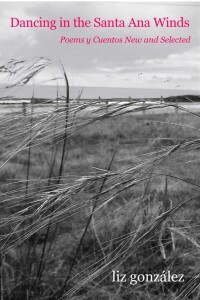 Purchase “Dancing in the Santa Ana Winds”! In “Dancing in the Santa Ana Winds: Poems y Cuentos New and Selected,” liz gonzález explores memories, pivotal experiences, and cultural influences that shaped her: The death of a young father, family relationships that nurture and challenge, and the joys and struggles of growing up as a nontraditional Catholic Mexican American. Set against the diverse landscapes of the San Bernardino Valley and Los Angeles, these richly textured and sometimes humorous works, real and imagined, illuminate the trials and beauty of girls’ and women’s journeys to reclaim themselves. Overlaid with the rituals and imagery of the Catholic church and 70s rock, funk, and R&B bands pouring from car radios, the Inland Empire is alive with culture, sensation and the fullness of life. 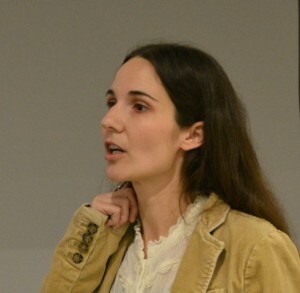 liz gonzález, MFA, grew up in the San Bernardino Valley. 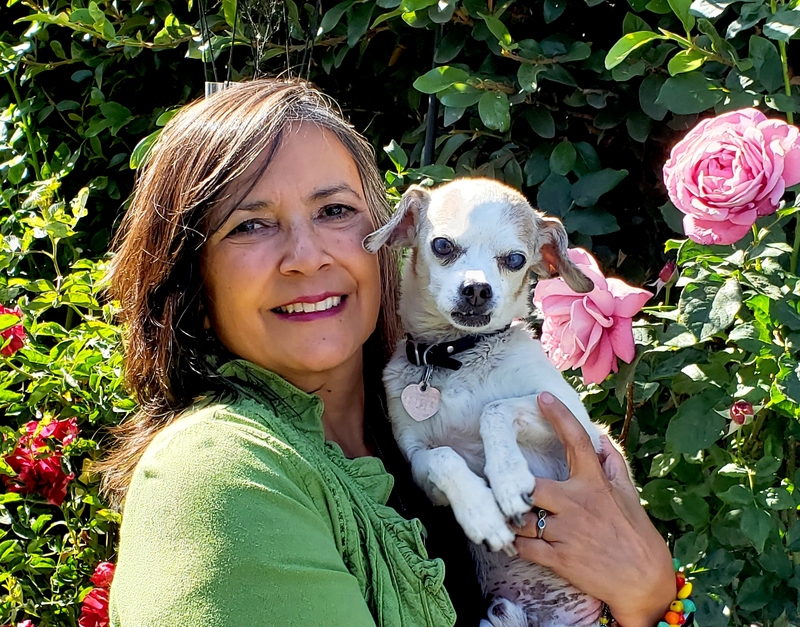 She is the author of “Dancing in the Santa Ana Winds: Poems y Cuentos New and Selected” (Los Nietos Press July 2018). Her poetry, fiction, or creative nonfiction have appeared in the “City of Los Angeles Latino Heritage Month Calendar and Cultural Guide,” “Inlandia: A Literary Journey,” “BorderSenses,” and “The San Francisco Chronicle” and has been widely anthologized. She is the author of the poetry collection “Beneath Bone” (Manifest Press 2000). Her awards include an Arts Council for Long Beach Professional Artist Fellowship, an Elizabeth George Foundation Artistic Grant, and residencies at Kimmel Harding Nelson Center for the Arts, the Lucas Artists Residency Program, and Hedgebrook. liz lives in Long Beach, California, with an indifferent chihuahua, a talkative tortie cat, and Jorge Martin, a scientist and musician. She directs Uptown Word & Arts and is an instructor for the UCLA Extension Writers Program. 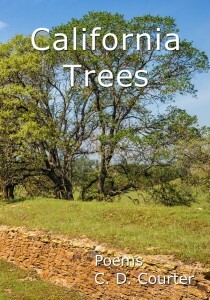 Los Nietos P ress is proud to announce the release of California Trees, a collection of new poems by Southern California poet and photographer Kit Courter. 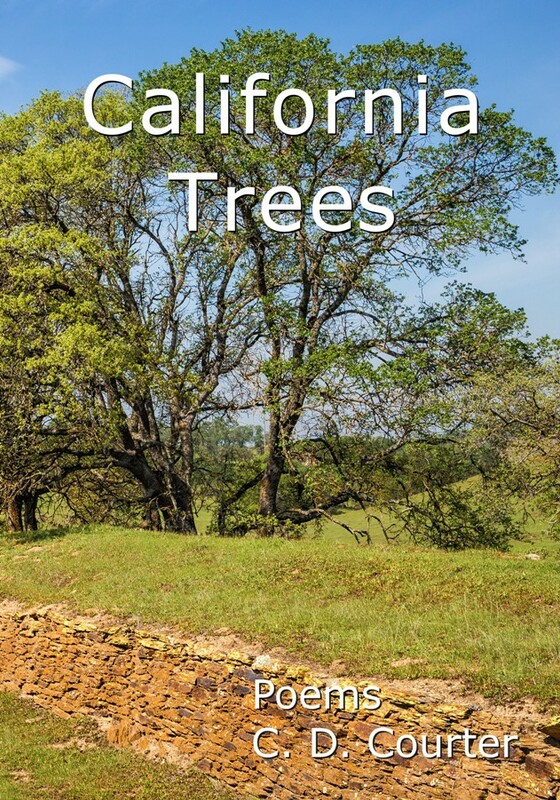 Accentuated by Courter’s photography, this book about trees magically becomes about the lessons passed down from mother to son, our relationship to nature, and who we become because of it all. 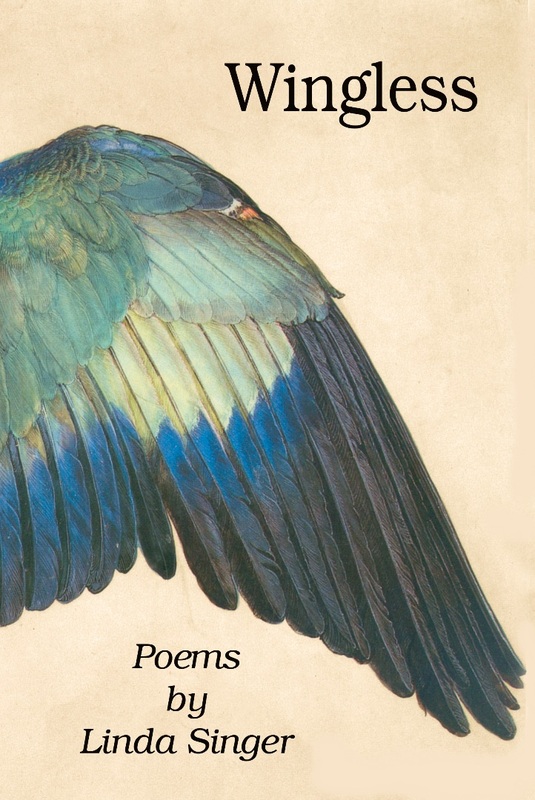 Los Nietos Press is proud to announce Linda Singer’s new book of poems, “Wingless”. 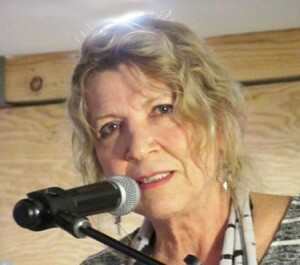 Linda Singer is a Southern California poet who has been published in several poetry journals including Lummox, Incandescent Mind, Short Poems Ain’t Got Nobody to Love, The Moment, Manuscript, Addiction and Spring Harvest. 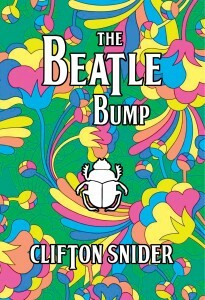 A must read for any Beatles fan, Clifton Snider’s book of poems, The Beatle Bump, is an inspired, unique look at the greatest rock ‘n’ roll band of all time. 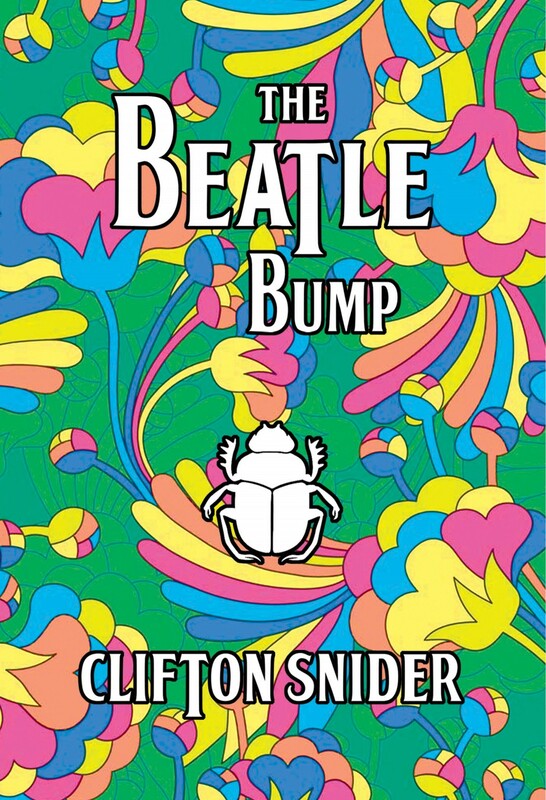 Written in the years after the murder of John Lennon, The Beatle Bump explores the Beatles as an archetypal, in the Jungian sense, world-wide phenomenon. The poems, often irreverent and playful as were the Beatles themselves, are written in a variety of forms–free verse, song lyrics, nonsense verse, a sonnet, and even a couple of fan letters. The Beatle Bump is both a time capsule and a work of lasting art. 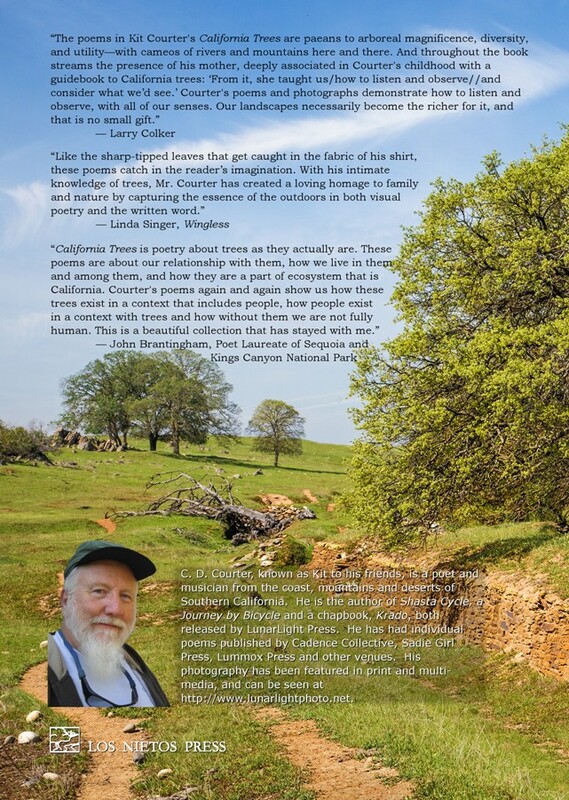 Clifton Snider, faculty emeritus at Cal State University Long Beach, is the internationally celebrated author of ten books of poetry. A career retrospective of his work, Moonman: New and Selected Poems, was published to great acclaim by World Parade Books in 2012. He has published four novels, including his first historical novel, The Plymouth Papers (Spout Hill Press, 2014). A Jungian/Queer literary critic, his book, The Stuff That Dreams Are Made On, was published in 1991, and he has published hundreds of poems, short stories, reviews, and articles internationally. 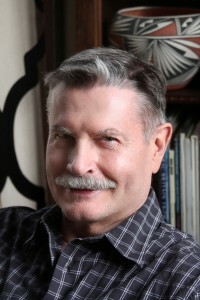 He pioneered LGBT literary studies at CSULB. His work has been translated into Arabic, French, Spanish, and Russian. 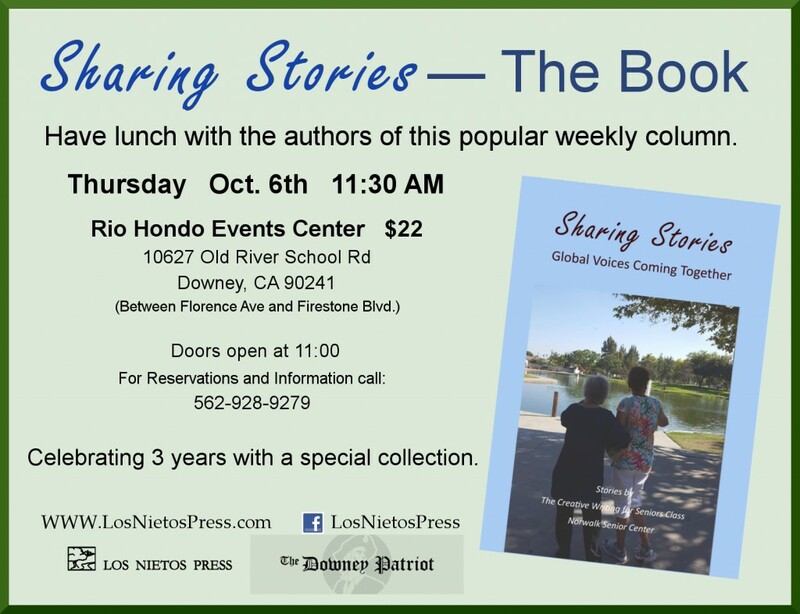 Los Nietos Press is pleased to announce the release of Sharing Stories: Global Voices Coming Together. 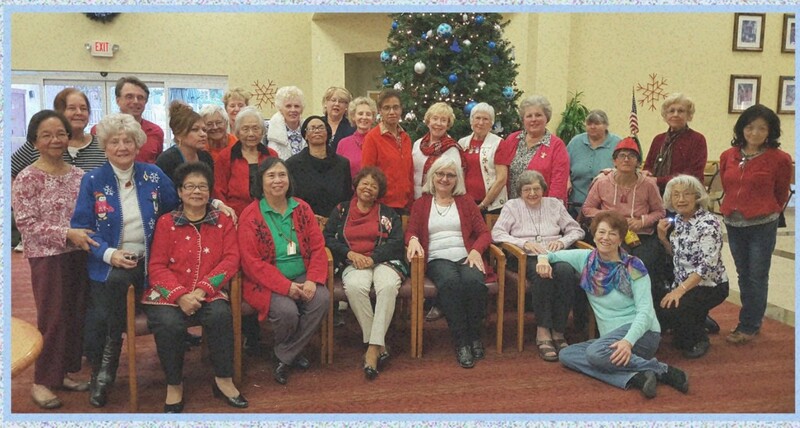 This collection of 39 stories by members of the The Creative Writing for Seniors class, held at the Norwalk Senior Center, is a celebration of the stories that have poured out of this class over many years. The anthology contains the work of 39 authors, selected from the “Shared Stories” columns that have appeared over the last three years in The Downey Patriot and The Norwalk Patriot. For more than a decade, a senior center southeast of downtown Los Angeles has been a gathering place for individuals who come to learn about writing and to share their stories. Some participants join the group as new writers, while others have dabbled in poetry and various forms of prose. It is a friendly group, always open to newcomers. Members come from all walks of life – housewives, office workers, veterans, educators, medical personnel — and their backstories reflect the diversity of southern California. They are both native born and immigrant. Some grew up without running water in the Midwest, others grew up without running water in the Philippines. Some grew up experiencing the conflicts of the segregated South, others had their youth sacrificed to war, here and in the Pacific. In various ways their stories reveal strength, courage, curiosity, compassion, and a desire to remain engaged with life. 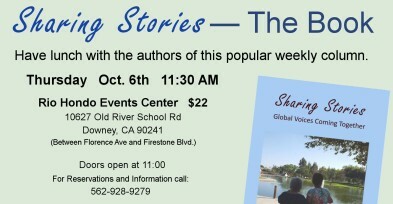 Three years ago, The Downey Patriot began featuring the stories from this writing group in a weekly column, “Shared Stories.” This anthology celebrates the column’s anniversary. This second collection of poetry continues Trista Dominqu’s tour through the blue-collar working class Southern California that moves beneath the glitz of Hollywood, the money Santa Monica and the Chrome skyline of Downtown. 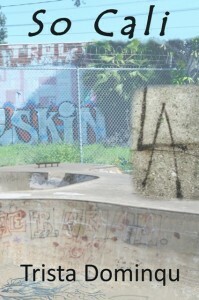 In poems such as “So Cali”, “Working Class Blue” and “45 minutes of Spanglish” she explores the world of steel-toed shoes, tattooed forearms, skate parks and mills South East of the city epicenter. This book is personal, matter-of-fact, and will reach your soul. Dominqu’s first book, “The Beauty of Muttliness,” debuted in 2013 at Poetry Matters. She has also performed at such venues as the La Puente art walk, Poetry Palooza and the Green Salon. Her work has appeared in Full of Crow and Cadence Collective online poetry magazines, and multiple anthologies by Cadence Collective, Lummox Press and Lucid Moose Lit. Downey poet and artist Rosalie Desimone Sciortino will be the featured reader for Poetry Matters, Thursday, January 15, at Stay Gallery. 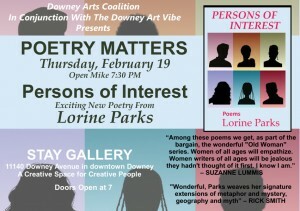 Her work over the years has had an impact on the Downey arts scene in many ways. 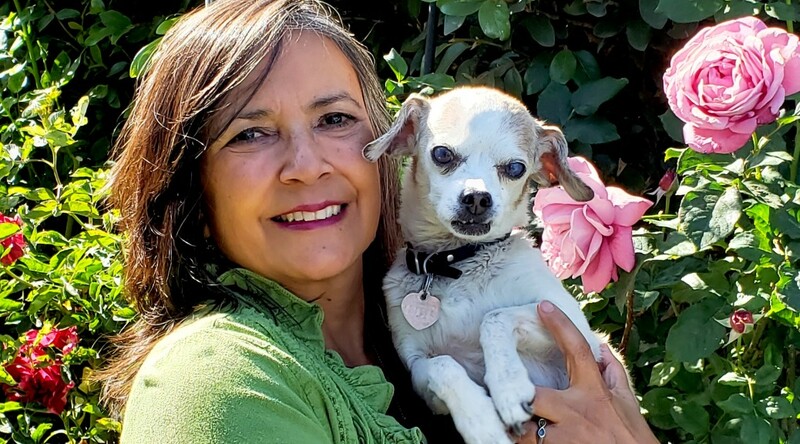 Sciortino was a leader in Writers Workshop West (a writing group spearheaded by theater director John Hume), and a board member of the Downey Art League. She has often been a contributing writer to the Downey Patriot, and before that the Downey Eagle. Doors will open at 6:30 PM for a reception, and her artwork will be on display for a week. Reflecting her wit and creativity, Sciortino’s new book, The Gift, includes a whimsical short story and several memoirs of her Downey childhood, in addition to her lyrical poetry. 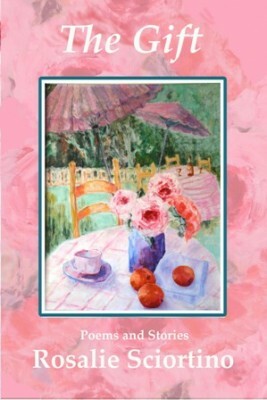 Her poems convey her love of nature and reflections on the human spirit. “Her gift is the transformation of the common to the uncommon,” writes poet Zaida Ramos. Sciortino is a virtual native of Downey, having arrived here with her family when she was just twenty days old. Her parents, who met and married in Colorado after immigrating separately from Sicily, settled into a farmhouse with acreage at the corner of what is now Paramount and Florence where the Chase Bank sits. At that time Paramount Blvd, known then as College, dead-ended at Florence, and vehicles were only able to turn east or west. Sciortnio recalls that loaded hay trucks would shake the timbers of the house as they rolled to a stop at the corner. In the 1970’s Sciortino was an active member of the Downey Art League when the organization’s membership was at its height. She explored a variety of media, including oil, collage, and acrylic, winning numerous prizes. Her subjects range from stylized still-life’s to realistic figures and cityscapes. As an avid KABC listener, Sciortino’s prize-winning success was legendary. She twice won tickets to an opening game of the Dodgers, several dinners at high-end restaurants in Beverly Hills, and tickets for the Cirque de Soleil when it premiered during the Los Angeles Olympics in 1984. Sciortino’s impact on the Downey art scene extends beyond her own writing and painting. Sciortino has contributed years of community service as a member of the Downey Symphony Guild, helping with fund-raisers that support the regular season concerts and the Music in the Schools program. The music education program, started in 1995, serves 11,000 local elementary students in the area’s public and private schools.